I am taking part of the Personal Democracy Forum (#PDF14) in NYC. 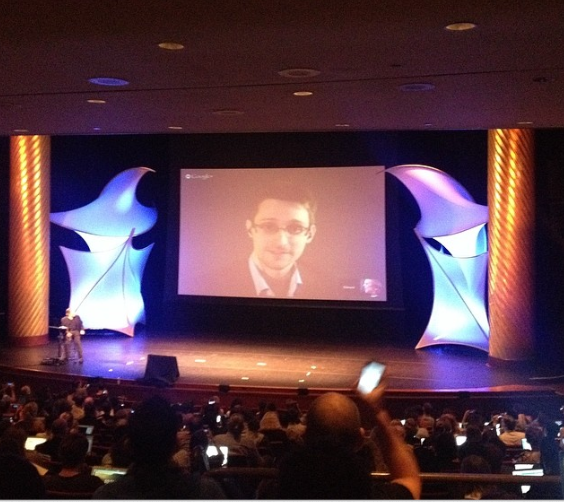 Edward Snowden is one of the first speakers, via Google+, honoring the NSA Leaks that he provided exactly one year ago. In and of itself, this is a great example of the complexities of internet rights. Snowden can’t be here in person. His live image is presented by the tech that an organization that has a stake in the surveillance regime. Now that organization is part of the Reset the Net campaign and has launched a new encryption tool for gmail. But his dialogue with John Berry Barlow of the EFF has turned even more basic — and profound — than I could have ever expected. What are data, information, and knowledge? How do different stakeholders understand those terms? What can big data and metadata tell about us (as I mused before). How do we weigh ‘security’ as a priority? As Barlow joked, for him, “security comes always 3rd”. This reminded me of the recent debate about “trigger warnings” and our obsession to be safe. Is it time to reconfigure our understanding what safety and security are? Zygmunt Bauman talked about the unholy trinity uncertainty, unsafety, and insecurity already while back, as the core definers of “liquid modernity”. How right he was. I didn’t do anything remarkable, I’m not particularly morally gifted. I did my civic duty. The reason that people don’t campaign against to solve these problems because they don’t see them. Once again, it is about the change starting with the grassroots, people, developers of crypto, or whistle blowing, or… As Snowden’s ending words just stated, structures of power will need to bend when the conversations like those around the NSA start to happen en masse. If you want to support Snowden’s legal defense, go to: freesnowden.is.